How simple a motion to intevene can be: organization name, contacts, and Basis for Intervening. Filing to intervene gets your foot in the door for any further filings or legal actions or participation in hearings. It does not require filing major legal documents at the outset (or ever). It does require filing your motion to intervene by 24 December 2014. It would be prudent not to wait until the last day: you never know when FERC’s efiling system might be down. The Florida Gas Transmission (FGT) pipeline is an approximately 5,500-mile system that transports natural gas from south Texas to south Florida. 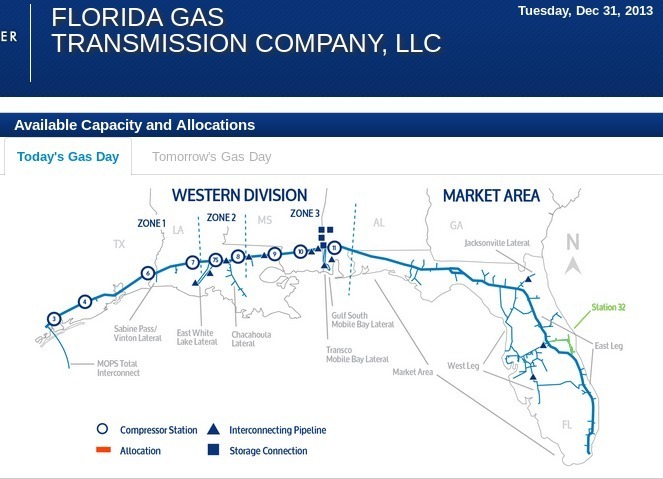 FGT is owned by Florida Gas Transmission Company, LLC, a 100% owned subsidiary of Citrus Corp. Citrus Corp is a 50/50 joint venture between Kinder Morgan, Inc. (NYSE: KMI) and Energy Transfer. FGT didn’t mention in this filing, but it knows sinkholes. Just a year ago FGT had to move its pipeline off of the famous 25-acre sinkhole in Assumption Parish, Louisiana.